Media captionDriver: "I woke up 10 metres from the tram stop"
Four drivers have admitted falling asleep while operating trams in Croydon, where seven people were killed after a tram derailed in November 2016. Drivers said a safety device, known as "a dead man's handle", failed to activate and stop their trams. Tram Operations Ltd, which runs the line, said driver fatigue was monitored and controls were "fully functional". An interim report into November's crash suggested the tram was speeding and the driver may have "lost awareness". It found there was no emergency braking and the tram had been travelling at 46mph before it crashed in a 13mph zone, near the Sandilands Junction area of Croydon. However, a BBC investigation for the Victoria Derbyshire programme, has found that at least three trams have been recorded speeding on that same line since the derailment. One was travelling at 40mph in a 25mph zone. Another is understood to have been speeding near the crash site. Four current and former drivers have also admitted they have fallen asleep while driving a tram. Konrad Turner, who retired last year after driving trams in Croydon for 16 years, said he woke up 10 metres after passing the line's George Street stop, adding: "A person was very fortunate that I didn't run them over." Mr Turner said his tram's driver safety device - which is used on different types of tram across the UK and Europe - failed to work. Drivers have to apply 1.5lb of pressure on a lever and push it forward for the tram to accelerate. If pressure is not maintained, a safety device inside the lever should activate - sounding an alarm and then applying an emergency brake. There is no suggestion a problem with this device was responsible for the derailment at Sandilands. Guidance from the Office of Rail and Road (ORR) safety regulator says the driver safety device should activate "in the event of driver collapse". Further guidance also states the device should be designed "so that it cannot be kept in the operating position other than by a vigilant tram driver". But six drivers said the device was not "fit for purpose". One said drivers were afraid to tell management about safety device failures because they feared being sacked over falling asleep. "You're asking somebody to come forward and admit to something that could cost them their job," he said, adding that he believed most drivers had fallen asleep at some point in the career. The BBC has uncovered three incidents in the past decade where drivers were incapacitated. They include a near head-on collision, a collision with buffers, and a driver failing to slow down at the line's Morden Road stop. On that occasion, the driver was only woken when he was spotted by ticket inspectors on the platform, who radioed his cab. In November, footage released by the Sun showed a driver who appeared to be asleep for at least 30 seconds continuing to power a tram on the line. Transport for London told the BBC the driver safety device failed to work because the driver had not completely lost consciousness. "If he were to completely pass out and lose consciousness then he would relax his grip," director Leon Daniels said when shown the footage. Another driver told the BBC of a dead man's handle failure in May 2016. He said a spring in the device had broken, causing the alarm and emergency braking to be initially delayed, before failing altogether. The driver told the BBC he reported it immediately. He said he was told it was safe to continue. "[I said] if I have a heart attack or become unconscious this tram will go through the buffers at Beckenham junction at 50mph and kill more than likely myself, the majority of people on board and around the tram. "Only when I said that [did they say], 'Take it out of service straightaway.'" In a statement, Tram Operations Ltd, said there was not "a full failure" of the driver's safety device and passengers "were not at risk". It says the tram was later "examined" and the fault was rectified the next day. Transport for London said the "tram was still operating safely". The Office of Rail and Road (ORR) safety regulator said it was not made aware of the incident, but a "failure should be reported". 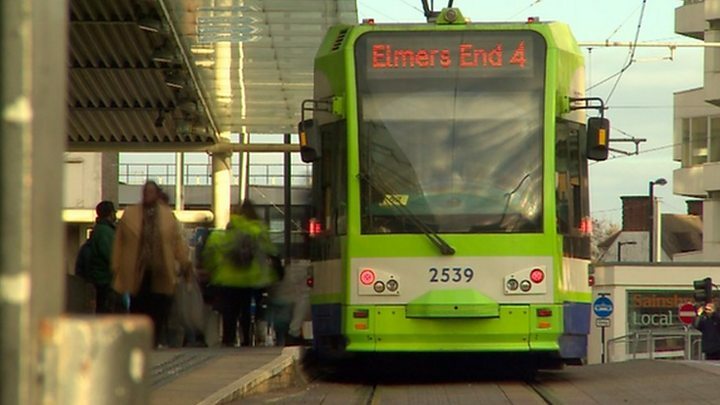 When questioned on allegations of trams exceeding speed limits in Croydon, Tram Operations said it had increased speed checks across the tram network since the crash. Do you have a story you would like BBC News to investigate? If you have any information you would like to share with the BBC, you can email newsinvestigations@bbc.co.uk.